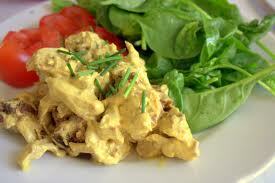 Coronation chicken. A fancy name for a simple dish. Originally, it was dish made for the coronation of Queen Elizabeth II in 1953, and is a simple mix of cubed cold chicken set in a creamy curry sauce. Like a wonderful play on curry chicken salad. Personally, I think it’s delicious and a refreshing change of pace. This is not ordinary mayonnaise based chicken salad. Lots of dry spices and raisins give it incredible depth of flavor, almonds give it more personality, and mascarpone cheese adds more creaminess than just mayonnaise alone. It’s a remarkable dish. The best mode of consumption, in my opinion, is as a finger sandwich, served on cinnamon raisin bread. It’s rich and highly seasoned, and not appropriate for an entire sandwich. As an appetizer or tea sandwich, it’s perfect, and I hope you enjoy it as much as I do. Prepare a gas grill. Make sure the heat is high, grates are clean and well oiled. Lightly toss the chicken with the vegetable oil, cajun seasoning and kosher salt. Grill, lightly blackening on each side, until cooked through. Let cool completely. Dice chicken into 1/3 in cubes. Dice the bread into 1/4 in cubes. Put everything in a large mixing bowl and mix well. Season with salt and pepper. Add a little more mayonnaise if mix is too dry. Serve on toasted slices of cinnamon raisin bread, in the fashion of finger sandwiches.